AVIA Moonrise is an application that presents an accurate moon phase and the official sunrise, sunset, moonrise, and moonset times for any place on Earth and for any date between Jan 1,1900 and Dec 31, 2099. The application instantly shows the appearance and events for your iPhone's current location, and you can quickly check any location in the world using the map view (see usage instructions). Perfect for fishing or hunting trips, or astronomers and astrologers. all algorithms have been updated to include the latest modifications, and verified against the US Naval Observatory and major astronomy sites. AVIA Moonrise is quick, easy to use, and universal! Simply start the app, and you can start exploring the astronomical data. The app will ask you to turn on location services. If you are going to use the map view, enable Internet access also. At launch, the home screen displays the Sun and Moon data for today's date, accounting for the phone's timezone and Daylight Saving Time. You can change the date by using the arrow buttons and reset it to today's date by tapping the date. Rotate the screen right for the Next Full Moon display. Rotate it left for a 2-week Sunrise/Sunset view. 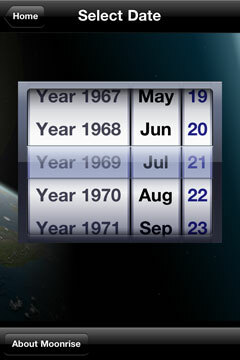 If you wish to check a historical date or a future date, tap the Date button. If you want to plan a hunting trip or see if the sun will be up when the plane lands at a vacation resort, tap the Place button. This view calculates the correct Sun and Moon data for the destination, if it's in an "on-the-hour" timezone where the phone's Daylight Saving Time is in effect. Barring a few overlapping days in spring and autumn when DST changes, this is true for many countries - but when travelling or checking trips from one hemisphere to another, be aware that the general rule is that when DST is in effect in one hemisphere, it is not in the other. This happens when travelling from South America to North America or from Europe to Africa. This just concerns the rise/set times for the destination (pin position) - information for the phone's position is provided by the phone itself, and moon phase is not dependent on an exact local time. 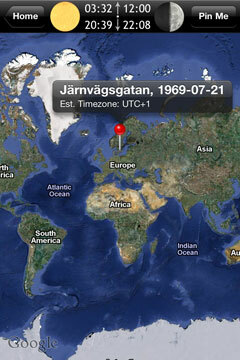 Currently, only commercial services exist that can report timezone and DST for any GPS position on a world map. If you would like to see such a version, email us and say so, and it might make it into the Pro version! Sunrise and sunset times are always for the date displayed. For moonrise and moonset, things get a little more complicated, since these times can span the boundary between dates (also known as midnight!). USNO reports two rise and two set times for a given date. To keep things simple, we don't report rise/set times for the day before/day after, but the times labeled just "Moonrise" and "Moonset" on the USNO website. 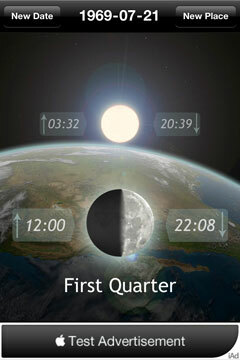 Moon phases are a little easier, since you are usually only interested in the moon phase as seen during the night. The phase and percentage correspond to the "Fraction of the Moon illuminated" at midnight (beginning of day) you see at the USNO website. Therefore, if, for example, the fraction goes to precisely 1.00 at 9pm on 25 August, the 100% Full Moon will be shown for midnight, 26 August (and likewise if it goes to 1.00 before noon on 26 August). All times are displayed in local time (at the phone's location or the pin location). if the Airplane Mode has been turned on, turn it off and double-check that the timezone and DST has been refreshed in Settings before starting the app. How automatic this is depends on the operator you have. You may have turned off automatic Time Zone when it drained battery under iOS 5 a while back. You must enable it during traveling if Moonrise is to function correctly. It should be safe to do so if you are running iOS 5.1 or later. While the app itself supports iOS down to version 4.0, versions prior to 5.0 didn't adjust DST reliably. Unless you use the app solely for the moon phase, it is recommended that you run at least iOS 5.1 on your iPhone. With the usage documentation in mind, if you still get what you think is incorrect data, we would like to hear from you! Simply email what you think is wrong to us, and it will be corrected in the next version. The Moonrise application is developed by Avia AB, Eksjö, Sweden. Check out our other apps on AppStore!